Epidemiology in Country Practice presents the development of the catarrhal jaundice and myalgia. It discusses the epidemiological and clinical observations of country doctors. It addresses the conditions of life of a country doctor. 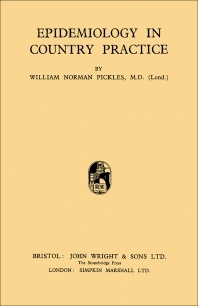 Some of the topics covered in the book are the appeal to improved medical research; methods of communicating medical research; techniques in acquisition of clinical data; types of diseases of the people living in the country; description of influenza, measles, scarlet fever, whooping-cough, and mumps; and diagnosis and behavior of chicken-pox and shingles. The description of sonne dysentery is fully covered. An in-depth account of the diagnosis, symptoms, and treatment of undulant fever are provided. The characteristic mononucleosis of glandular fever is completely presented. A chapter is devoted to the classification and description of different skin conditions. Another section is focus on the diagnosis of malignant disease.